A pen and ink and wash drawing of a youth with a cup of wine, a female figure reclining, and the drunken Silenus supported by satyrs. Inscribed on the verso: No. 52 JS. 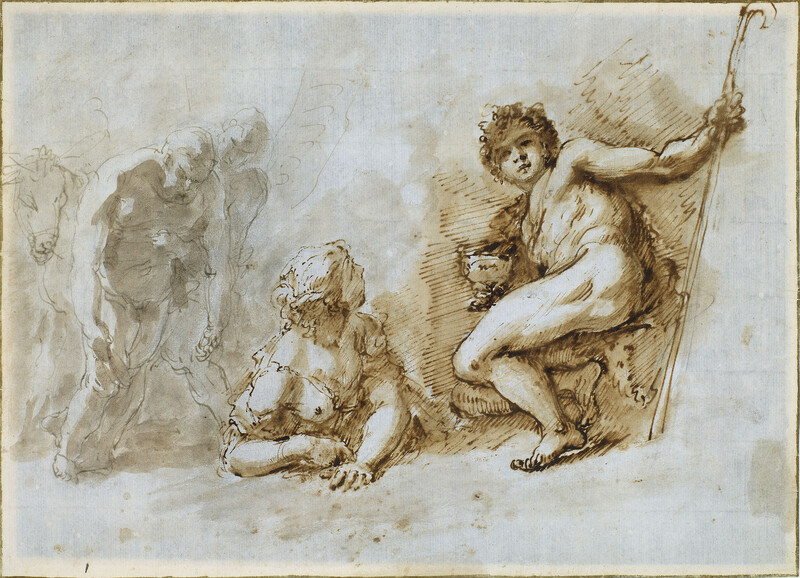 The drawing is a preparatory study for a painting of the Bacchanal with drunken Silenus. Ricci painted two versions of this subject, paired on both occasions with a scene of a Bacchanale. One version of the Silenus painting, now in the Worcester Art Museum Massachussetts, was commissioned by Marshal Johann Matthias von der Schulenberg in 1731 and sold in his estate sale at Christie's, 12 April 1775, lots 37 and 38. The second version of the pair was sold at Sotheby's, 11 March, 1966, lot 102, formerly in the collection of Andrea Memmo in Venice. The paintings were engraved by Leonardis in 1763, probably the versions in Memmo's collection. Another drawing in the Windsor album (RCIN 907019) is executed in the same manner and with the same ink. Another study for the Silenus painting is RCIN 907024.